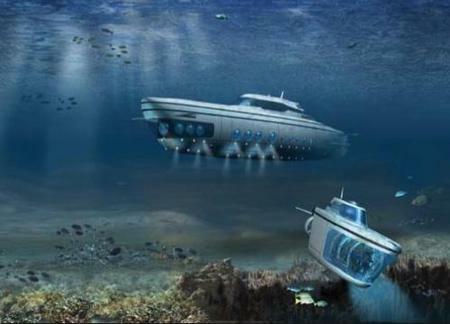 Oh, I'd really like my own luxury submarine. It's my birthday soon. But $78 million is a bit expensive of course. This is the Phoenix 1000. The Phoenix 1000 is a 65-meter (213') personal luxury submarine. The initial design was originally executed for a client and now awaits a buyer. As proposed, the submarine would constitute the single largest private undersea vehicle ever built, and arguably, one of the most significant personal transportation devices of the century. This design, which we have named the Phoenix 1000, has more than ample space. The total interior area of the submarine is in excess of 460 square meters (5000 square feet). The significant volume, coupled with very large acrylic viewports, and the potential for relatively large open spaces, results in a vehicle as luxurious as the finest of motor yachts. I probably shouldn't even be looking in brochures that say 'perfect comfort', 'unsurpassed' and 'ample' in every paragraph. But a luxury submarine is a nice thing to dream about. Have you seen this show? It’s like a great big warning sign about the level that inequality has reached in America today. In one episode, the birthday boy spends $250,000 on jewelry. In another, the birthday girl gets an $800 manicure with real diamond inlays. In another episode, the birthday girl spends $5,000 on her dress. Mind you, here are people spending hundreds and hundreds of thousands of dollars on 16th birthday parties in a nation where over 37 million families live in abject poverty on less than $20,000 a year. Worldwide, there are more than 2.8 billion people who live on less than $2 per day. Think about this for a second. There have been 46 episodes of “My Super Sweet 16″. Let’s assume the average spent per party is $500,000. That’s $23 million spent on 46 sixteen-year-olds. That same money, distributed in the world’s poorest communities, could double the standard of living for over 31,000 people for one year. Hmm… But I guess these sixteen-year-olds really need such extravagant parties, not to mention the expensive luxury cars that each kid inevitably gets as a “surprise” gift at the end of each episode. In the United States today, the rich are richer than they’ve ever been and while many of the rest of us are struggling just to get by. Bear in mind, as foreclosures have risen rapidly in the United States, luxury yacht sales have also skyrocketed. I know I already made this point, but it’s important. The top 1% of Americans control 19% of the wealth. And they’re not necessarily putting that extra money into creating new business investments that kick start jobs in poor communities. They’re spending it on yachts and private islands and other obscene luxury items, which the rest of us then watch on MTV and E! News and the Wall Street Journal, feeling jealous and inadequate. In an era where inequality has never been worse and the planet can’t continue to stand for such lavish excess, the glorification of wealth leaves many of us wanting to be rich, too, instead of wanting to tax the hell out of the super-rich who’ve made their money largely on the backs of poor and middle class workers. But we can’t criticize the super-rich if we’re too busy wanting to be rich ourselves. I’m struck that the Super Sweet 16 birthday parties seem mostly about creating for the spoiled brats the sense that, at least for a moment, they’re famous. Inevitably, in each episode, there’s the scene where the birthday boy or girl arrives at the party destination in a stretch limousine or horse-drawn carriage or something, friends lining the street screaming — not necessarily out of adoration but probably to be the one adoring-seeming-enough to get on camera. The birthday brat steps out of the car. The fans go wild. Just like being at the Oscars, or being president maybe. Except, of course, these sixteen-year-old rich kids didn’t do anything to earn fame. They bought it. But the fact is that it’s enough, at least for one night — that these kids and their parents are willing to spend what in some cases amounts to more than the annual gross domestic product for a small island nation, says something about the nature of fame and celebrity today. When we elect millionaires because they buy their way into office, when our most talked about celebrities are best known for infrared videos and DUIs as opposed to… oh, I don’t know, maybe talent… we should start to worry we’ve become a deeply shallow country where who we are and how much we have matters more than what we do — where buying fame becomes equivalent to earning fame if no one pays attention to the difference. It bears repeating. We can’t have an honest conversation about how to address poverty and inequality in the United States until we confront wealth and the reality that wealth, directly and indirectly, causes poverty. Directly, those with money are often getting more of it because others underneath them are getting less ( e.g., the Walton family which profits from the low-wage sales clerks and sweatshop workers behind Wal-Mart). Indirectly, those with lots of money inflate the costs of things the rest of us need — like gentrifying affordable neighborhoods into luxury enclaves — or drive down the quality of services the rest of us rely on by privatizing their own part — like putting their kids in elite private schools instead of public education. The problem is that the rest of us — those struggling to make ends meet, with shaky health care or no insurance at all, with mounting credit card debt and college tuition, facing a pile of economic worries that only seems to be getting bigger — don’t seem to think the solution lies in holding the super-rich accountable through taxes and other regulations. Instead, we each take a sort of individual salvation approach, as though the economy is a deepening hole so the only solution is to find your own ladder. But there are only so many ladders. And those at the top tend to be operating big digging cranes that make the hole worse. Couldn’t we instead embrace solutions that improve the economic situation of all of us — including taxes on super-rich individuals and businesses that help fund public education and universal health care and the things we need as a society if everyone is to succeed? I usually watch “My Super Sweet 16″ at the gym. I’m generally paying more attention to the show than my abs, though inevitably several moments per episode I double over in discomfort, which is kind of like a sit up. My hope is that when the rest of America watches this show, we collectively double over — and redouble our efforts to create a just economy that works for everyone. Sally Kohn is the director of the Movement Vision Project, working with grassroots community-led organizations across the United States to identify our shared, long-term vision for the future. In principle I think that everybody should live in abundance, and have their own submarines and space stations. The problem with this world where the inequalities are so huge is not so much that some people have a lot as it is the fact that it buys them the "right" to be fantastically more wasteful and abusive. If you can afford it nothing stops you from staying in the air in your 747 24 hours a day, or for that matter, having a fleet of other 747s follow you, just because the sight is pretty. It isn't illegal, and somebody who can buy the planes and the fuel is free to do so. There's of course something fundamentally wacky about that. Likewise, if I have enough money, I can hire thousands of lawyers and have them sue hundreds of thousands of people for no reason and make their life hell, like the music industry megacorps are doing right now. "Too much" money, or for that matter, the "right" to create (very large) corporations with limited responsibility - that creates an inequality which is worrisome. It is not that they have a lot, but that they can waste and abuse a lot, and that there's nothing much to stop them, if they don't run out of money. We have a vision of an inherently fair society, with democracy and a free market, where everybody has an equal chance, more or less, to make a difference. But that's not what we live in, as we have neither a free market or a real democracy. When I show up on my bicycle, they have the possibility of sending an aircraft carrier. Which is no longer a one person one vote, free market, kind of thing. Some people have 100,000 votes. If we all were on equal terms, with one "vote" each, no matter how many resources we had, things would be quite different. There's no inherent problem with having a lot, if you don't at the same time keep others from doing the same, and if what you have is sustainable. The trouble is that a lot of the ways of "having a lot" that we see are made exactly out of keeping others away from something, and are terribly wasteful and unsustainable. If you can afford your own super-jumbo jet, you could of course also afford arranging that your use of it had a negative carbon foot print. The famous black and white movie of the stranded German submarinists - one of the best 10 films ever made. True story of course with triple poignancy: The premier Anti-Hero Movie: for all the crew become incredible heroes in any man's creed regardless over and above any prevailaing faschist paradigm. The submarine removes the inhabitants from any real world in the absolute sense of the word as the above film testifies, uniting them humanistically on step to redemption. "Abundance" (for All) and when is there "Wayyyy Toooo Much" (for "Some" )? and more interestingly: when would there be Abundance for ALL??? Aren't these (at least ) some of the most burning questions humankind "should" think of, find a commom ground, reaching a suitable conclusion, and then live by it ( "... or else..." . Before (at least ) these questions are answered, any discussion about possible contradictions/dissonances between "Abundance" vs "Wayyy Too Much" is redundant! Let me give you an example, that -I think- highlights the importance of making these kind of questions clear: The number 'One' Rule among the "Insiders" is: "you can never be too thin (as in skinny) or too rich" (as in having material stuff, more than one can handle). In other words; these people are allowed to have material stuff (all of them in one way -or the other- stolen from the rest of humankind) into absurdum. To eat intelligently is after all one of those things which makes a person feel good about themselves -and Life in general...much more so than the show off of their Toys ever can! On the other end of the scale we have guys like Jesus, Mahatma Gandhi, Ivan Illish, Krishnamurti, Buddha etc... Do you think, these guys were self-denying-as in self sacrifying idiots, for not having ANY interest / need in -for instance- owning sub marines super jumbo jets, or even twenty, or so, homes? Do you think they felt deprived??? Screw the moralizing. That submarine is cool. quote 'The famous black and white movie of the stranded German submarinists ' what is its name and producer? it sounds really interesting. how about some superich greeny like the google lot buying it and offering educational trips to view dying coral reefs with the cost being related to your tax bracket! There's something fundamentally wacky about that. 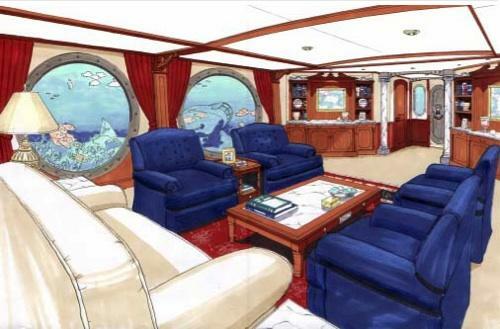 Of course it seems totally crazy that somebody can afford a private, luxury submarine. I do, however, hope he'll have fun diving with it and that what he'll see down there will inspire him to invest a lot of his money in projects to protect marine environments. Even as a child I dreamt of such things like submarines with big windows and even though I will probably never be that rich I see no reason to envy the owner. Lots of third-world people will never be able to afford what I can afford, including a dive in one of those submarines 10-15 tourists are seated in front of huge windows. If any of you really want to see what far-away exotic planets in the universe are like, take a look at this one - under water - first. There are things and creatures you never dreamed of. Well, it's awesome. From Jule Verne with love. I love Jules Verne too. I have read many of his romans in childhood. I decide to keep the shirt to remind me why I chose Dauntless in the first place: not because they are perfect, but because they are alive. Because they are free.